Adjective. Colloquial (originally Anglo-Indian). Also cushty. Early 20th century. Of a post, task, etc. : easy, comfortable, especially more so than might be expected. If your vocab is lacking that little bit of Anglo-Indian Peckham piquancy, it is my kushi (Urdu 'pleasure') to introduce you to cushy, or Del Boy's favoured variation of cushty if you prefer. Of course, if you're from Britain you're probably already well used to this pukka little number as it's been in constant use since World War I. Even so, I bet you didn't know its origin was Urdu, did you, you saucy little git. Ah ha! See? That's what Lexicolatry does; brings you the creme de la menthe of cosmopolitan vocab. Mais oui, my friend, mais oui. Do please leave your cushiest little numbers in the comment box below. I didn't know the origin (thank you Lexicolatry!) but I always liked the sound of the word. It's somewhat similar to 'cushion' and 'cushioned'; I suspect that's part of how it stuck in English. Urdu is a long way off, but 'Indian' would certainly be interesting, particularly a post on all the words in English of Indian origin. There must be a few with British Imperial Past and all... not so many rubbed off on us - Portuguese - from our colonies. They're planning to change Portuguese spelling to Brazilian? Quel fromage! I thought they had already done that some years ago with Portuguese? And Teresa ... Only Fools is a national treasure in England! 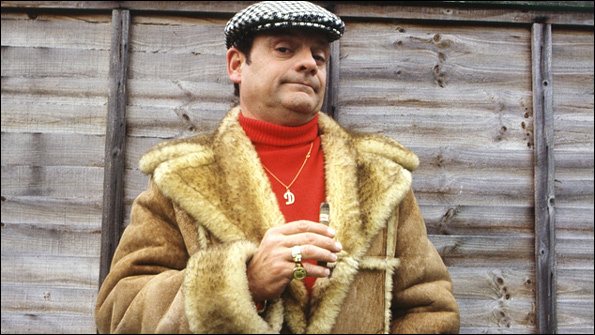 It has some of the best-loved characters in all of British television, including Del Boy in the picture who is, as you rightly see, very funny! Well 'cushy' is definitely British slang but 'cushty' cited as being derived from Romani in the dictionary, I don't think I've heard 'cushty' uttered outside of Only Fools & Horses and then years late out of the mockney mouth of Jamie Oliver, mange-tout? Hmm. Now that you mention it, I don't think I've heard 'cushty' anywhere else either, and not even from Jamie. A number of people learn a new language viewing it as a spare time activity and exciting hobby, a few for some other reasons. Each nation has their very own national language like English being UK's and US's national language.